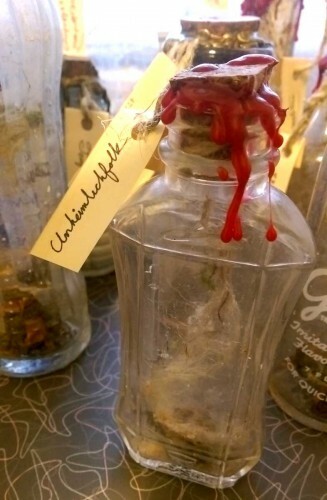 There are many stories and legends about trapping spirits or imps in bottles, and they are especially fun to make and display at holiday time. 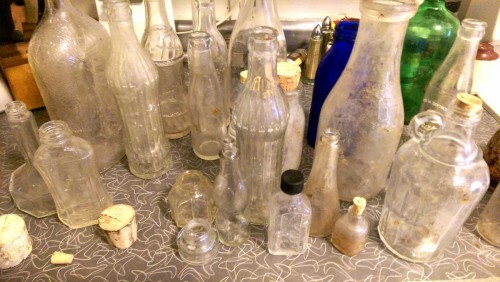 If your bottle is stained or streaked from its long dirt nap, you may wish to do nothing else but cork and seal them. But if you want them to look more spooky, you can put bits and bobs in there that look a bit creepy… Found natural objects, like seeds, leaves, and feathers work. And you can add bits of moss, sting, and the like as well. Not to give too many of my secrets away, but you can pull apart some strings to make wispy webs — and I like to toss in a bit of flour and other bits to make some dust and things stick to the webs. You don’t need to add much of anything really. The simple “what is that” factor behind some cloudy glass in a distinctive bottle has a large effect. Now you need to seal the evil spirits inside the bottles. For bottles without any caps or lids, I use cork stoppers. And I like to smudge the corks up a bit to make them look older and creepier. 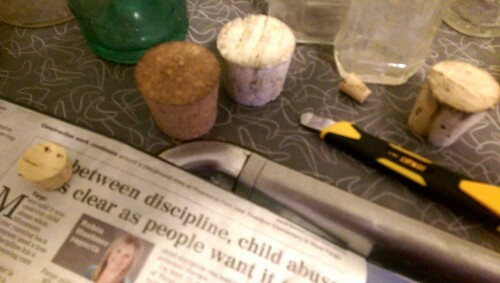 It’s easy to do this by rubbing the corks on newspaper. Given the random range of bottle sizes, you’ll likely need to cut or chop some cork pieces to fit. That’s OK, because they look old that way too. 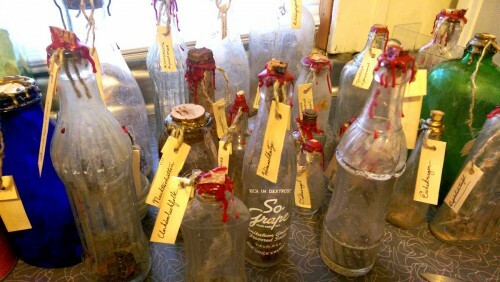 Once the bottles are sealed and the wax cooled, use twine to tie on some paper labels. We used slips of old paper from a sadly-too-damaged “lost” antique book to make labels, writing names for witches, demons, and diseases in German, Russian, and French! For finishing touches, I pulled strands of the twine part to have older looking strings. And we rumpled the edges of the paper tags too. 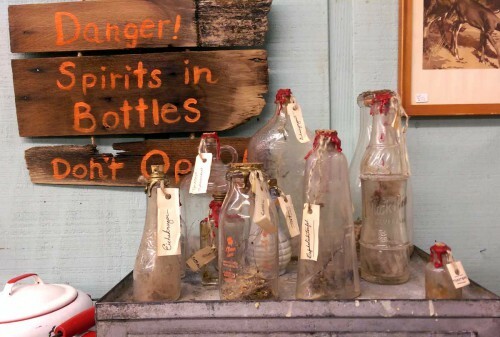 For the antique shop, I made a large display of the spirit bottles, hand-painting warning signs on more of the antique wooden shingles. 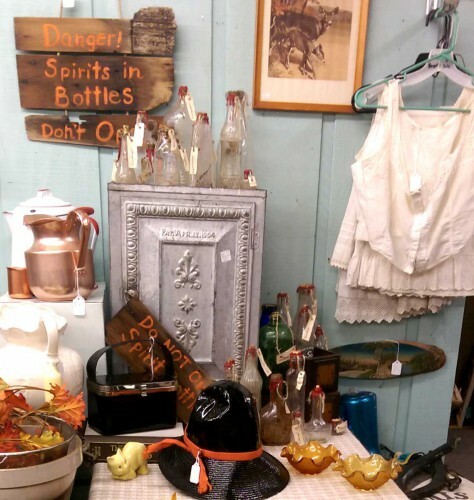 We set down a vintage black hat and a few more seasonal items to create a little Halloween vignette. 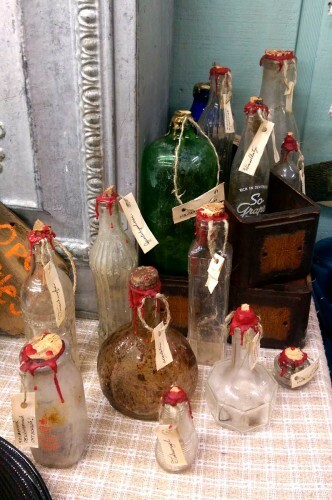 If you don’t want to make any spirit bottles yourself, you can come buy some at the antique shop — or contact us. We will ship! UPDATE: You can now find the spirit bottles and signs in our sister shop, LunaTiques! 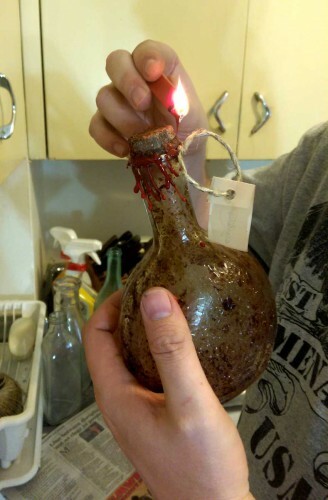 4 Responses to "Making Spirit Bottles"